Use this high quality, liquid latex masking material to create your own custom stencil designs or mask off to protect a spot too difficult to cover with masking tape (like in between letters or words). Can also be used to repair tears in Rub Ã¢ï¿½ï¿½NÃ¢ï¿½ï¿½ Etch stencils. 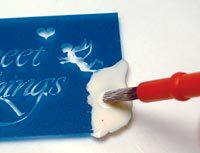 Applies easily to glass, just paint on with a craft brush and let dry. Not gummy like most resists! Dries clear or can also be tinted with food coloring. Can also be used on wood, leather, metal, and ceramics. Removes easily from glass when done!